A huge blow for the Vikes already struggling O-line. The Minnesota Vikings have been dealt a massive blow on Thursday, when it was reported that guard Nick Easton will miss the entire season. ESPN&apos;s Adam Schefter spoke with Easton&apos;s agent, who said the offensive lineman has undergone surgery on a herniated disc on Thursday morning. It will likely keep him out for the entirety of the 2018 season, though shouldn&apos;t prove a career ender. 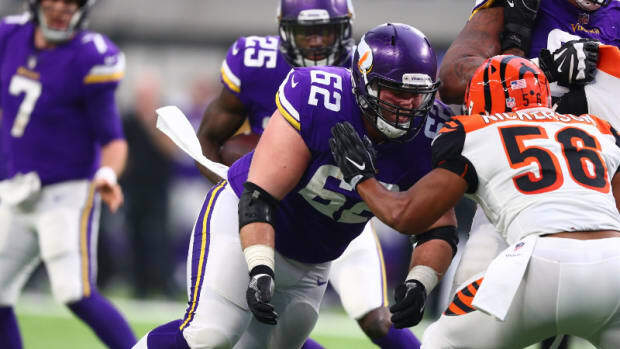 It&apos;s a colossal loss for the Vikings&apos; already fractured offensive line, with starters including Mike Remmers and Pat Elflein both currently laid up with ailments. Easton was expected to start at left guard, and with him out Minnesota will likely turn to veteran Tom Compton, a native of Rosemount, Minnesota who has experience playing with quarterback Kirk Cousins in Washington. Aviante Collins would be another internal option. Easton&apos;s absence is especially harmful because he is the primary backup center to Elflein, who has been on the physically unable to perform list since the beginning of training cam. There&apos;s hope that Elflein will be fully recovered from offseason ankle and shoulder surgeries in time for the regular season. Cornelius Edison has been taking first-team reps in practice while Elflein and Easton have been out. A weak draft class of linemen means the Vikings will have to pay up for immediate improvements on the O-line. Minnesota has yet to upgrade its offensive line. Paul Allen says he's received good information that Cousins likes the Vikings. The Vikings placed offensive tackle DeMarcus Love on injured reserve with a damaged pectoral muscle on Monday. Love was expected to be one of the first backups off the bench because he can play multiple positions on the line.